One of our challenges as a country is that many of our fellow Bermudians are either unemployed or underemployed. At the same time employers are seeking work permits for thousands of guest workers. Some are doing specialist jobs in IB or healthcare that not enough Bermudians are not qualified for. However, the reality is that many of our guest workers are doing skilled trade work that Bermudians traditionally have been masters at. Professions such as, but not limited to; Auto mechanics, Masonry, Carpentry, plumbing and AC repair are now predominantly populated by persons on work permit vs. born Bermudians. There are a host of reasons for this including; persons not wanting to learn these trades, perceptions that these trades are not high paying jobs or just a societal shift towards white collar employment. The net result is that we find ourselves in a situation that is not sustainable. As such it is easy to identify the challenges, where the rubber meets the road is that we have to collectively point to viable solutions. The first step in this campaign is to have persons willing to enter these job fields. Without willing persons, we will remain on a downward trajectory when it comes to the number of Bermudians who have technical skills. The second step is to be able to train these persons in any number of trades.There will be different avenues of how this can be achieved. For some, it means being exposed to the trades by the tried and tested centuries old method of working with a master trades persons as apprentices. For others, it may mean taking up technical studies whilst in high school or Bermuda College. Interestingly enough, for the mature, 25 year old plus, segment of our population it will mean learning a new profession. There will be those who differ on the approach, yet will hastily agree on the need. The key thing is that we begin to get persons interested in what is available and on the path towards learning those trades. This week Sunday February 3rd at 8pm please tune into “Orders of the day” with Host Kim Swan. We will be hosting the first in a series of discussions on the way forward to get more Bermudians, of all ages, interested and qualified in various technical trades. 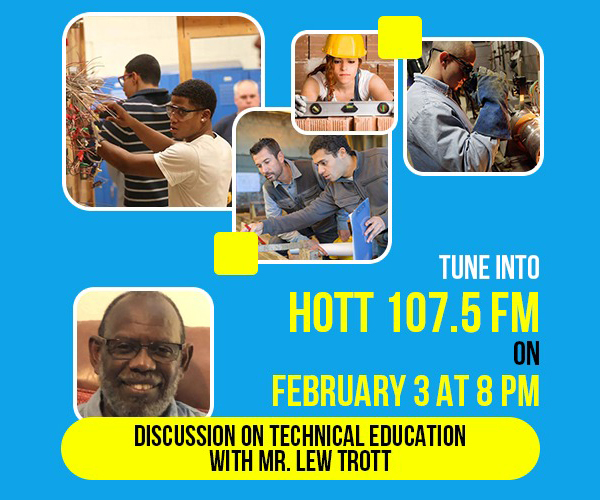 This week we will have as our guest, Mr. Lew Trott, a well known Bermuda Technical Institute Alumni and public educator who has been a lifelong advocate of Technical Education. We will discuss his experiences and some of the ways to produce our next generation of Bermudian trade persons. Ignoring the inevitable Famousesque anti-foreigner “thousands of permits” dog whistle, I don’t think anyone would argue against this…. Core question is, with a rapidly declining and ageing population carrying a heavy tax burden to service the PLP debt, who exactly will trades be servicing? It won’t matter you clowns will still sign off on work permits whilst your people sit home because of it. Membah that next time your kicking up about it at cabinet house. Note to police: proper use of pepperspray to dispurse is to spray the bottom of the person you wish to dispurse…not the face . So set up a trade school. You’ve got money to waste on empty offices overseas and millions to send to overseas millionaires as a gift. You’ve got 25-11. So set up a frikkin trade school amd stop whining. Get some of the useless people off the streets. It Is all about work ethic ,attitude and swinging the lead. No body want to be an aprentice for 7 years ! It took years to build 20 ft walls in 3 locations. Nr. Bottom of Burnt house hill. Who want to pay $90./ hr for a gofer or an on looker. They want the seniors to teach them the trades, Wow ! 50 years ago we used to call it 6 for 9 or Pay for 9 and get 6. Nothing has changed, except time outs for cricket ,weddings and funerals. The 3 hour difference is, arive late, go early, with two hours for lunch. Labour Unions brought the UK to its knees and we are next. You all want a plan its a REFERUNDUM. Bermuda needs to clean house. A boat with a hole in it will eventually sink. Government kicked seniors out the door at 65 now you are paying the price of the ” BRAIN DRAIN “. Here it is and how it is. Dept of Panning >>>>> Get rid of all shipping containers,Bermuda is no longer beautiful. The courts no more smack on the wrist >>>>>>> Token 7 days Jail time for all drunk drivers plus large fine. Token one day jail time for speeders plus double fine same for accidents where their is physical injury. We have to work on what we already have and work more efficiently by implementing new policy . You can not put breakfast lunch and dinner all on one plate. What you can do is teach every one to start working together, if not you will loose your home. Get rid of racism ,hate and crime and deal with those who are responsible for promoting it. you were not born to hate. To the man who stole from tourist last week, you hurt them, give it back ! Bermuda is no longer beautiful ! To move forward every one needs to think posative , be profecional, be efficient, all you have to offer just now is good service. Bermuda has what many don’t have in winter it is THE SUN , time to switch it on. WE ARE EITHER OPEN FOR BUSINESS OR WE ARE NOT. Tourist come here for a fun holiday give them the best and cut their cost we are too expensive, last day here free room. Many people felt insecure and were put off when the trades moves to the College. As with all things, trades require certification and qualification. That is what the collage was set up to do, to ensure people entering the trades could achieve and not be overlooked. I don’t get why Famous switched from skilled, masters of trades to people with no skills. Oh I do, he is politicizing this for propaganda purposes. Silly me. Focus on meeting the needs Famous and not talking about it. Leave the foreigners in the trades. They seem to enjoy the long hours and hard work even if it means weekends. They are reliable and get the job done. The facts are our men are no longer interested in these types of trade jobs. If they are both governments have put enough training programmes in place to skill them up. Today these unemployable don’t have a clue what they want to do. Is it just a job or a career? Instead of all the talking about trades schools, the government needs more talk about proposals to improve the economy. Let those sitting around doing nothing find their way to the many training opportunities available. Frankly you need to improve the scope of those in Work Force Development. Many are not impressed with that beauracracy.